If you’re a fleet manager, then you know what it’s like to deal with a less than model driver. They won’t follow instructions. Every stop light is an opportunity to check their phone. Their pickup and deliveries are never on time. You’re not alone! At Skypatrol, we work with fleet managers all over the nation with the same frustrations. In most cases, introducing them to fleet management software and a GPS tracking solution resolves their bad driver problems quickly. 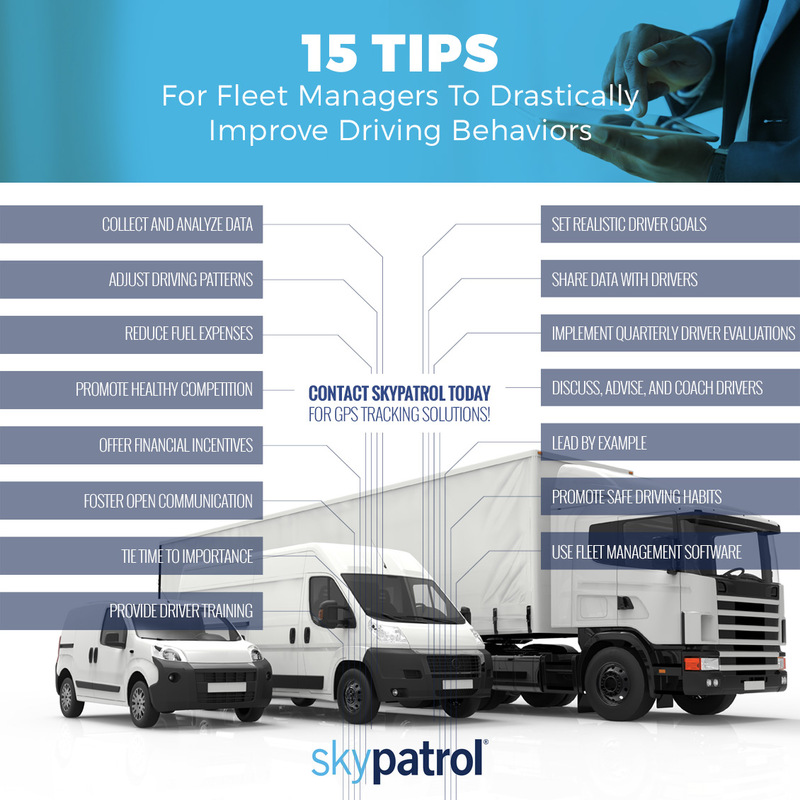 In this post, we’ll be sharing 15 tips to drastically improve your drivers’ behaviors. If you’re ready to enhance your fleet’s ability to deliver or pickup on time; reduce fuel cost and improve fuel efficiency; and keep better records on maintenance, contact Skypatrol today. In the meantime, read this post to learn more! With current technology, you are able to track your fleet down to the tenth of a mile. No longer are you in the dark while a vehicle is out making a delivery or pickup. Fleet management software allows you to always have a bird’s eye view of your fleet. This means that you’re able to collect data and analyze it for optimization or adjustments of daily operations. If you have a handful of drivers in your fleet participating in less than desirable driving behaviors, address them. With GPS tracking devices, you can monitor and track your entire fleet. Make sure they’re using optimal driving tactics to save you money while they operate. Engine idle, routes, and aggressive driving all have an effect on how the fuel in the vehicle is used. Check in on all fuel factors to reduce the cost of fuel and increase the efficiency of use. It’s amazing what numbers on a board can do to those who like to compete. Make a game out of fleet operations so that individual drivers can compete against one another. This will refresh commitment and inject a sense of pride back into their work. Financial incentive paired with healthy intra-company competition will raise your overall morale and commitment. Furthermore, as your company is competing internally, it’s going to make them better than the other fleets in the industry as a result. Encourage candid communication between colleagues, managers, and supervisors. Communication is key in any team endeavor. Your fleet will feel more comfortable suggesting possible ways to improve operations, and you’ll get to reap the rewards. Whether you’re in the medical industry, cab industry, or hauling industry, tie time to importance. If you can tie the ability to pick up, deliver, or otherwise to being an important metric, you will see a change in behavior to meet the standard. It can be tempting to hope that your drivers understand how to operate the vehicle they have five, 10, or 15-plus years driving. However, it’s imperative you stress the importance of safe driving, too. Offer training, courses, and advancement in certifications to promote safe driving expectations. Without a target, how will you know when your fleet succeeds? It’s important to set fleet and individual driver goals. Depending on your industry, you could set safe-driver, delivery, or other goals to give your drivers something to focus on achieving. If you notice an increase in fuel efficiency and a decrease in fuel cost, tell your drivers. The more you can tie their efforts to achievement and reward, the more they will work to perform at a higher level. It’s important to know what your drivers are succeeding at and struggling with. Make sure and give them the opportunity to discuss those thing with you. Also, completing quarterly driver evaluations helps you keep two fingers on the pulse of your fleet. As mentioned above, your drivers are the lifeline of your fleet. Invest in their betterment, and watch them do the same for our business. No driver is going to care about your fleet more than you will; it’s a hard fact to accept; however, you have the opportunity to lead by example. Take care of your vehicles. Reward drivers who perform well. Coach those who are struggling. Invest in the fleet, and it will serve you for years to come. It’s better to arrive late than not at all. It’s imperative you reiterate the importance of safe driving to your fleet. What’s more, you can use some of the other tips to promote this one mandatory expectation. Many of the tips above would not be possible without fleet management software and GPS tracking devices. If you’re interested in bettering your fleet and improving its performance, you need to consider investing in some kind of fleet management tools. Why Skypatrol Fleet Management Software? First and foremost, Skypatrol has more than one-million GPS tracking devices in over 25 countries. Not only do we know how to help fleet managers better their fleets, but we also provide them with the fleet management software to get the job done. If you’re ready to improve fleet performance and efficiency, it’s time you spoke to us about GPS tracking solutions and more! Contact Skypatrol today!